If you walk into the Forum Gallery at the Carnegie Museum of Art somewhere near the middle of The Living Need Light, The Dead Need Music, you might think you’ve stumbled into a Vietnamese karaoke bar. On a large screen, a melancholy woman sings a mournful tune as she floats downriver in a boat. While this segment resembles a sentimental Southeast Asian music video, as a whole this 21-minute piece is compellingly complex and rich with poetic symbolism. 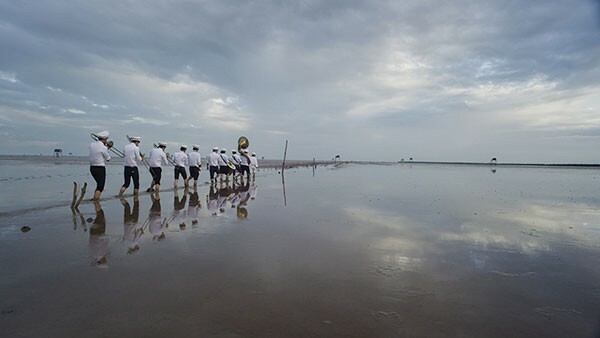 Shot in ultra HD, the video was made by the artist collective The Propeller Group for Prospect.3: Notes for Now, the 2014-15 International Arts Biennial in New Orleans. And indeed, it must have resonated deeply there as it focuses on the musical traditions of funerals in Vietnam, which bear a striking resemblance to the brass-band funeral traditions of NOLA. Surreal and dreamlike, the loose narrative follows three protagonists — a boy, a trans woman and a bandleader — through a dizzying array of vignettes. But ultimately the central characters in this mythic tale are death and music, as suggested by the title, which is taken from a Vietnamese proverb. At traditional funerals in Vietnam, music accompanies the deceased on their journey and eases the sorrow of the bereaved. Initially it is somber, but it turns upbeat for the procession to the tomb. By mixing footage from real funerals with a mock funeral, the filmmakers pay homage to what they consider to be a form of public art and a deeply political statement, as religious expression has been discouraged but nonetheless tolerated under communism. In addition, by collaborating with their subjects, the artists readjust the viewer’s gaze so that the subjects are always in flux and the final piece becomes both documentary and reenactment. 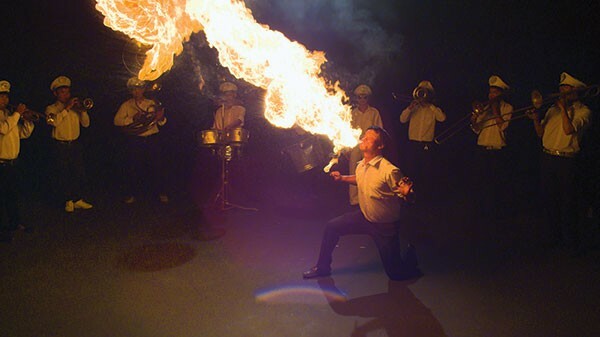 The protagonists traverse both urban and rural landscapes, participating in spectacles that include professional criers, street performers, fire-eaters, snake charmers, sword swallowers and other sideshow theatrics. As a reflection of the Buddhist notion of impermanence, the delineation between death and life remains elusive. The artists are not interested in epistemological truths but rather truth in flux, or truth that might be embedded in mythologies. This is evident in many of their other works. “The AK-47 vs the M16,” in this year’s Venice Biennale, is comprised of a slow-mo video of bullets from each weapon colliding within clear FBI ballistic gel and, in a nearby glass vitrine, the actual block of gel containing the results. Inspired by an American Civil War artifact of two bullets that collided, the artists wanted to apply that same mythology to the Cold War in order to mine the poetics of past traumas. In another piece, “Television Commercial for Communism (TVCC),” the artists of the Propeller Group — the collective is based in Los Angeles and Ho Chi Minh City, in Vietnam — worked with an advertising company to rebrand an ideology. By working collaboratively, they are already redefining their roles as artists. But they take it even further because they are also a full-service production company. Called TPG Films, they work with entertainers as well as with other visual artists. Phunam, one of the three artists who make up The Propeller Group, with Tuan Andrew Nguyen and Matt Lucero, writes: “Confusion is good. When people are confused, they actually have to think.” This confusion is very Yes Men because there is also a different The Propeller Group, which does advertising and production, and a separate PR firm called Propeller Group. Nguyen writes: “The ultimate collaboration would be this: ‘The Propeller Group’ would create an idea for a film and hire ‘The Propeller Group’ Los Angeles company to produce it and ‘The Propeller Group’ PR agency in the U.K. to promote it.” The artists actually have two websites: one for their art and one for TPG, with some crossover. However, neither one appear to be a spoof. Lucero’s quote on one of the websites states: “Michael Asher was a pioneer, but perhaps his most compelling ‘institutional critique’ was his death. What is more meaningful and compelling than death?” And so we are back to death and to the mournful, euphoric and fantastical spectacle that is the video on display in the Forum Gallery. While it is perhaps not as resonant in this geographical location as it would be in New Orleans, the topic of death is universal. Featured in the video is the song “Mot Coi Di Ve,” by Trinh Cong Son. Translated as “A Place To Leave From and Return To,” it has become a standard at many Vietnamese funerals, and no doubt in karaoke bars. According to the artists, the video is shot like a music video as homage, and in the most genuine way possible.